Having problem with your electronic equipment because of a electrical noise interference? You switch on your fan across your room. Your TV gets the disturb, then starts to flicker or blank out for a short pulse of time. Your mobile is receiving an incoming call and your audio speaker starts to give out weird sounds. These are a few of the common electrical interference that we usually encounter daily from our digital devices and appliances. Electrical noise is very common in any electrical appliance or electronic devices. It is always there, but we can’t see it with our eyes nor we can hear it with our ears. But we can learn more about electrical noise and prevent them from affecting our equipment system, the way we want them to operate. In this article, we will focus solely on the most commonly encountered switching noise and how we can prevent them. What is an Electrical Noise? Most people, even a trained person tends to perceive “Noise” as a single entity. When an electrical problem occurred, blame is typical pushed to an entity known as “THE NOISE”. In reality, the electrical noise that is affecting your electrical or electronic appliances is simply an unwanted electrical signal which you don’t want. There is no difference between a signal and a noise in terms of the electrical properties. 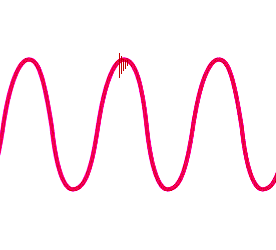 A signal is something desirable, something that you want, while noise is the signal that you don’t want to have. Unwanted electrical signal (“Noise”) itself can be in many different forms. This returns to a need to understand how electrical/electronic actually works. A real world is never ideal, not perfect. It is important to understand these imperfections so that we can minimise the undesirable effect that it could bring. Noise is something very common in our everyday electrical appliances. A common source of noise spike usually comes from the switching on/off of an inductive load. An inductive load could be a motorised fan, door bell, magnetic ballast lighting which we will be discussing here. There are also many other types of noise and sources of noise which are rare and not often encountered. Usually, noise does not cause much of a problem. When an appliances or electronic device has low immunity to noise interference, it may be affected by the noise and results in undesirable operation. Most of the time this can be avoided through proper wiring method. If proper wiring is not a solution then you will have to add in additional noise filtering product to minimise the interference. Intermittent failure found on electronic device or electrical appliance is very difficult to troubleshoot. Very often, it indicates that the source of the noise problem is not clearly understood yet. It is important to come up with a hypothesis about the source of noise and think of a way to reproduce the problem. If you are able to reproduce the problem consistently, you would have already solved 50% of the problem. “Noise” may sound like an entity which people tends to perceive. People tends to relate any electrical problem to the “noise”. In practice, the word itself is an abstract name. It is actually not something easy to resolve even for a trained engineer without enough practical experience. There are many types of electrical noise interference that need to be differential through a troubleshooting process. An experienced engineer can have that instinct to detect that problem. A new engineer will have to start his own hypothesis and conduct experiments to verify his understanding of the subject (a practical learning process). All appliances generate some sort of noises. Appliances are also subjected to be affected by noises. The type of noises and its magnitude can trigger your appliance to misbehave. Noise coming from another device connected through a shared physical wire. Noise magnetically induced from an adjacent device or wire. Noise radiated from a distanced device or wire. Noise can simply come from anywhere to any appliances. Here, we will only discuss the commonly encountered noise that is due to the improper way of wiring the electrical infrastructure. There are proper ways to reduce these interferences. First, we have to know where the noise comes from and how it gets into our device. Knowing it will allow you to apply the right solution to the problem. You can’t just blindly buy a surge protector or noise suppressor and expect the noise to go away. The problem can only go away if you apply for the correct medicine. The following, we will focus on the simplest, most common noise on the power line. One of the most common electrical noise problems in Singapore comes from current ripples propagating from a switching inductive device. A noisy device source is usually not a significant factor which can disrupt your sensitive devices. However the electrical wiring in Singapore is often in the form of single core wire looping, it becomes easier for the noise to interfere with other devices. For a typical home and office electrical installation, the incoming power is typically split into 2 main groups. One group for lightings and the other group for the 3 pins socket electrical mains. For a group of sockets located within a room, the code of practice for electrical installations (CP5:1998) allows multiple sockets to be looped (linked) together using a single wire from the main circuit breaker (MCB) box. This form of looping creates a lot of disturbance for the latest low power/voltage electronic from noisy appliances. This can be observed at times when you switched on a fan in a room and the TV located near or in the same room gets a flickering or sometimes the screen gets blank out. This may happen to radio where the sound gets chopped off. Switching inductive load is a source for noisy appliances. 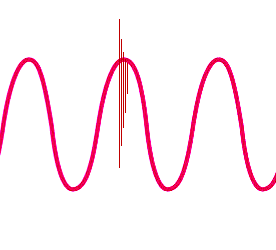 The switching of an inductive load if happened at the peak voltage can generate a significant spike of noise. Switching at the zero-crossing would be calm, with no noise generated. Some modern appliances are designed to switch at the zero-crossing which helps reduce the emission of these noises. For other appliances, it is a matter of random chance that the spike noise is generated. These can be observed at times when you switch on the lights. Sometimes, you can see an electrical spark inside the switch panel when the light is switched on. This is when the connection to the lights load near the peak of the AC power. The following are some of the common noisy appliances. 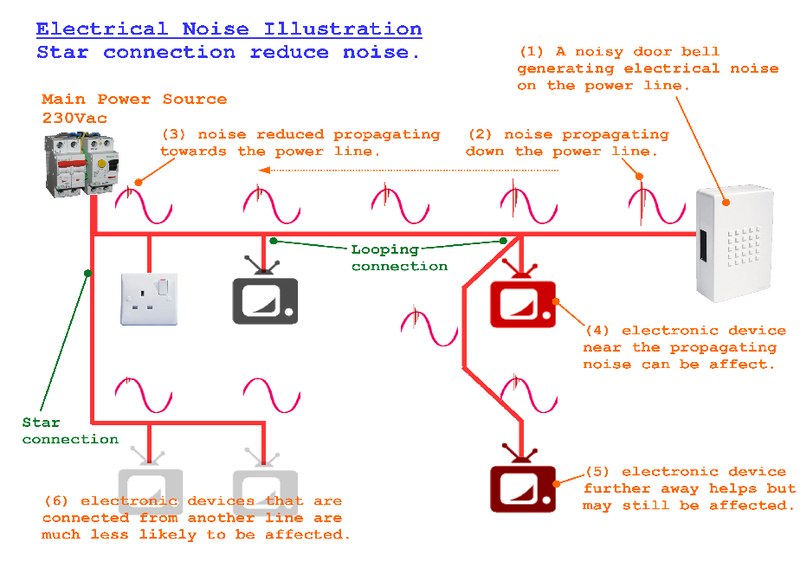 There are many ways to reduce electrical noise depending on the nature of the noise. The following are 2 simple precautions you can take to reduce the chances of noise. Using a star connection helps isolate a noisy line from your electronic appliances/devices. Noise generated by noisy appliances like a wall switch or some door bell can propagate down towards the power line. Noise will get attenuated as it travels down. Electronic equipment or devices that are installed near the path of the noise can be affected. You can imagine the noise propagating like the wave on water. The wave will fade off when it is further away from the source. Most electrical wiring in Singapore do looping connection to reduce the wiring cost. It makes more economical sense to tap power from the nearest power line rather than to lay another long wire from the main electrical box. There is an installation standard governing the maximum number loop that an electrician is allowed to loop. If your electronic device is an important part of a system, it is better to have a dedicated electrical line (STAR connection) laid specially for it. 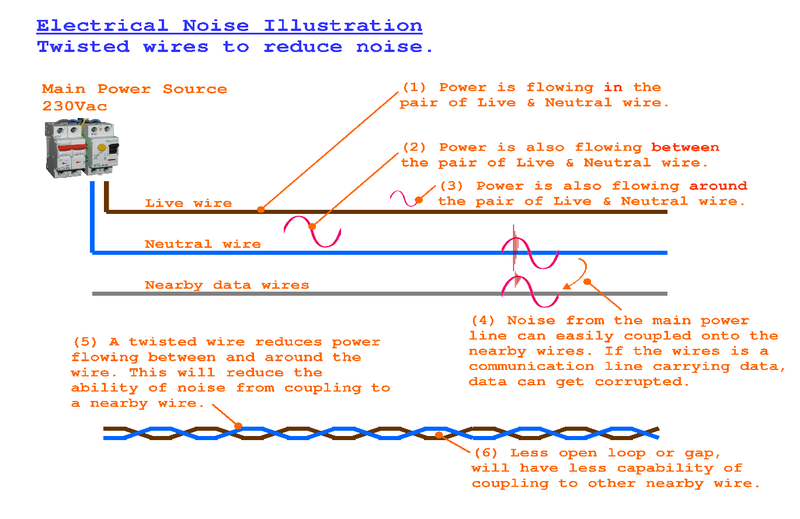 Noise can be coupled from one wire to another. It is important to keep data communication cables away from the noisy source as noise can be coupled and corrupt the data transmission. Further distance can help reduce noise. Shielding of the noisy and data cable also help reduce the chances of noise coupling. The reason why noise can be coupled to nearby wires is due to the electromagnetic property of electricity. Most people would think that the electrical power and signal is transmitted through the copper wire inside the wire’s insulator. This is only partially correct. While most of the energy is contained within the copper, there is also energy (power) flowing between the wires and around the wires. If there is a wire nearby, this energy can be coupled to it. This is also why in most data communication cable, the data line (differential pair) is often paired up as a twisted wire. The reason for the twist is to ensure that there is a minimum gap between the two wire. A close gap means less chance of induction noise coupling out. A twisted pair wire will induce less to the outside. The opposite is true, a twisted pair wire is less influenced by external noise. If you have done the suggested basic noise prevention method as suggested above, you would have propably reduce the probability of failure by at least 80%. On the market, there is a wide range of noise filter, noise suppressor, anti-noise products. These products may not necessary helps if you did not ensure the basic wiring is done properly or understood the noise problem correctly. Wiring should be grouped accordingly to the signal type. There are standards that provide a reference guide as to how the wiring should be laid to reduce the probability of encountering a problem. They are the EIA/TIA-568 for Commercial Wiring Standard, and EIA/TIA-570B for Residential Wiring Standard. There is a trend of installing a master switch to switch off all your appliances (non-critical). This means that when you are out and nobody is at home, you can simply switch off the master switch, instead of going room to room to search for lights and appliances to switch off. Of course, power to the security system, refrigerator and the fish tank water filtration and oxygen system, etc… should be switched on at all times. Network points to every room from a central location is recommended. There should be a minimum of 2 network point per room. The network point can also be used for the analogue/digital telephone line point. Wireless is also a trend. As much as possible, avoid wireless. For a new home, it is better to plan for Ethernet/Fibre network as the data communication structure. Use wireless as a solution for existing home when there is no way wire can be laid. PIC-CONTROL provides consultation service to local businesses in Singapore if you need further help for your electrical noise problem. The consultation fee starts from $500 (fee to be collected before the first meeting). This fee does NOT include the implementation of the solution.